The Cervical Screening Initiatives Program is a provincial program collaborating with regional health authorities, non-governmental organizations, health professionals and individuals to improve the coordination of cervical screening and increase participation in screening for women of Newfoundland and Labrador. The CSI Program was launched in 2003 with a gradual implementation across geographic regions and infrastructure. The goal of the Provincial Cervical Screening Program is to reduce the incidence of cervical cancer for women in Newfoundland and Labrador through a coordinated cervical screening program. 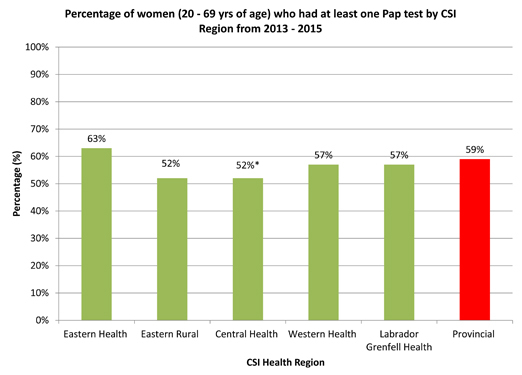 How does Pap testing benefit the women of Newfoundland and Labrador? Over half of the women diagnosed with cervical cancer in Canada have not had a Pap test in the five years before their diagnosis if ever! Not having regular screening is one of the biggest risk factors for developing cervical cancer. The routine Pap test will detect changes in the cells if the cervix before they develop into cancer. Early stage changes will be monitored closely, and successful treatment options are available for more progressive cell changes. Regular Pap testing is the best option to detect these cell changes. The following chart demonstrates the percentage of women who have a Pap test each year! The provincial Cervical Screening Initiatives Program works closely with all physicians, nurse practitioners and health professionals to increase opportunities for women to be screened regularly. *Participation Rates are not adjusted for hysterectomy status. The Cervical Screening Initiatives Program is pleased to partner with a multiple of professional organizations to provide a collaborative approach to sustaining improvements in coordination of a comprehensive cervical cancer screening program.